Here on Utiket you can compare flight fares of hundreds of airlines. Utiket compares all flights, to hundreds of destinations worldwide helping you to find the best airplane ticket. Here is a list of all airlines, low-cost or also called budget airlines as well as full-service airline, flying to Singapore. These airlines are based in Singapore. 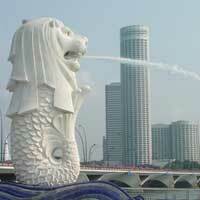 These popular airlines which have direct flights to cities in Singapore.